For more than 20 years, LifeNets (even before it officially became LifeNets) has supported the magnificient work of pediatricians and other doctors who have cared for disabled children in their Ukrainian province. The province of Chernihev was hit hard with radioactive iodine from the April 26, 1986 Chernobyl nucelar accident. The doomed power plant is located about 30 miles due west of where we work. My first visit to visit these doctors was in April 1996, ten years after the accident and a few months before the Centre officially opened and LifeNets has been actively involved. In a few months we will be celebrating its 20 year anniversary. We feel priviliged to have helped these courageous doctors who privately started this center. The government was supposed to open new rehabilitation centes in every province of Ukraine, but never did, so Dr. Vasyl Pasichnyk and other doctors did is on their own. LifeNets has helped with container shipments, vehicles, equipment, money and association with Rotary International and more. 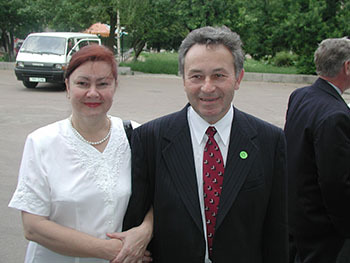 Dr. Vasyl Pasichnyk and his wife Natalya have been our close friends over these years and we love and respect them for their care of disabled children. Our story is told in large part on the Chernobyl section of the LifeNets Website. Our most recent contribution was a Timoko computer, a corrective-developing teaching device that is manufactured in Israel that we helped purchase this month in Kiev. A big thank you to you and members of the LifeNets charitable organization LifeNets for your partnership with “Revival,” medical social rehabilitation for disabled children. Because of what you have done, there has been a noticeable improvement in everything we do. We have built rehabilitation rooms as well as have bought diagnostic and rehabilitation equipment. Your financial support has helped with the health of 1000’s of disabled children. Also hundreds of poor children have received assistance who could not have afforded it. At any one time, the Centre accommodates 200 children for rehabilitation. Throughout the past year we had 1942 children come through the Centre for treatment. We seem to continually need various things. Every year in our province there are about 500 disabled children to take care of. They need intensive rehabilitation in the first years of their lives. We are operating now with notable stress as a result of the aggression of Russians in the Donetsk and Lugansk provinces. Some of the places where children were treated were destroyed during the war. Many people with their children moved away to other provinces. That’s why right now we are providing services to disabled children that are under the control of the Ukrainian army and those that have resettled to other provinces. Today at our Center we have 60 of these children. Four of the children were from territories that were controlled by the military. This is in those instances where the parents of sick children are fortunate to get through the military block posts. We also had three children from Crimea (Kerch and Sevastopol). All these children are treated by the funding that you and others have provided. At this time in our Chernihev province cares for 9929 refugees from the Donetsk and Lugansk provinces. Included in that number are 2190 children. From Crimea there are 3530 people, including 802 children. These children receive humanitarian assistance from charitable groups outside of Ukraine. 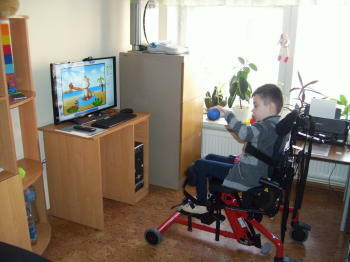 We also provide help for children who are not disabled but still have health problems. At the beginning of the school year we are helping the children of refugees, children of military who are fighting in Donbas and children of those who were killed in the war. For these who started the school year we inagurated a program called “Pershoklasnik” in which we give them a gift of school supplies and other very necessary items. We have also provided humanitarian aid to the soldiers of the Chernihev Volunteer Battalion. We gave them footwear, clothing, hygiene supplies etc. You see that the work of the Center is varied, however, our priority is to take care of severely disabled children. Rehabilitation equipment is used very intensively, therefore it wears out and needs to be replaced. Another problem – this is the transportation of children for rehabilitation at the Center. We have many families with disabled children, who live very poorly and often do not have enough money to come from farthermost parts of the Province – up to 220 km away. Government transport and public transport is not set up to transport disabled children, especially those in wheelchairs. We have to use our own transport. Right now at the Center have one minibus that we use to deliver children from the various neighborhoods of the province. This 12 seater Ford-Transit was given to us by the London Rotary Club. The minibus “Ruta” that you gave us in 2006 has already run 326,000 km. It is Russian-made and is in constant need of repair and has almost finished its service.